The starting point of any outdoor Christmas decoration is of course the lighting! Christmas lights have the ability of creating the perfect holiday atmosphere that every home needs. The more the merrier is a motto that should be thoroughly followed when it comes to lights. The best thing about Christmas lights is the fact they can be put practically anywhere; along the gutters, on Christmas trees, on the roof and fences – there are no rules. Try sewing a strand of Christmas lights into a large burlap piece or strips of colorful burlap and you will create unique DIY burlap garland. Also, try creating a twinkle light porch canopy, Christmas shadow boxes or wine-bottle accent lights for a festive table centerpiece. The choice of colors is one of the key elements for Christmas decoration. If you wish to achieve the perfect holiday ambient, the best way to go is with green, red and white, of course accompanied with traces of gold or silver. These colors are the main characteristics of Christmas and no decoration can be complete without them. Of course, incorporating other color choices is a good idea as well, as long as they radiate with delight and enchantment. Choose more subtle colors such are light blue, white and rose gold if you want to achieve subtle, elegant yet trendy decoration. On the other hand, try mixing bright orange, fuchsia or turquoise with some of neutrals and create youthful and bold yard look. 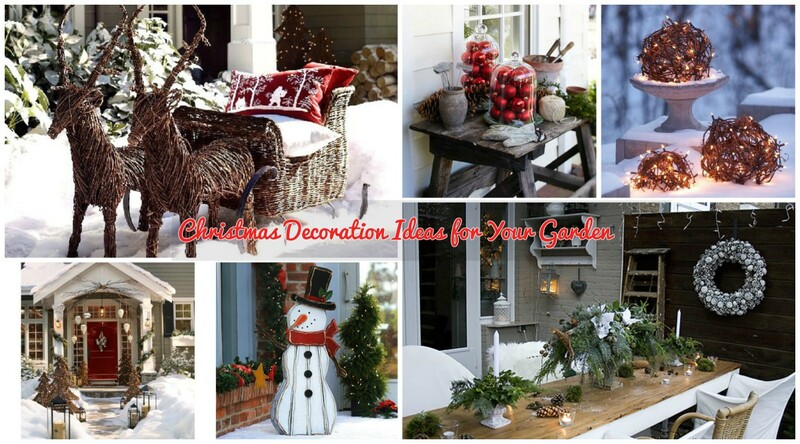 Another great idea is adding a little holiday spirit to your porch and your garden furniture. The best solution is to try and create a cozy ambient that will exude with warmness and comfort. This can be easily accomplished by adding a Christmas inspired carpet and placing dark wooden furniture decorated with small cushions and woolen quills. The focal point should definitely be the outdoor tables ornamented with winter plants and perhaps even some wrapped gifts just for show. Also, by adding real candles on your porch create that lovely authentic Christmas feel which can hardly be replaced by electric ones. Just make sure to protect candles from wind and cold by covering them with glass covers or jars. There is something depressing about undecorated doors and windows; they just give out the feeling of melancholy. This is why we should dedicate a bit of our attention on the embellishment of these details. 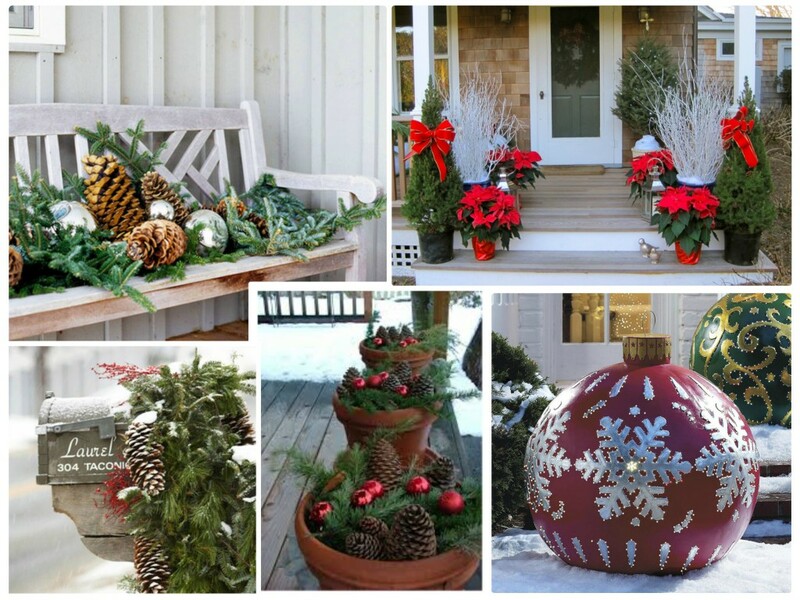 Wreaths with mistletoes and holiday doormats make a great decoration for doors. Golden and silver bells also work like a charm. When it comes to windows, garlands and bows create a wondrous Christmas ambient. Of course, Christmas snow spray for windows is also a great way to add a bit of joy to the whole space. Another interesting idea is to add a welcome doormat in front of your door. Not only it will serve its initial purpose for wiping your guests feet, but will also add a touch of colour. Nothing says Christmas like a decorated Christmas tree! This is a great way to add more life and feeling to your garden space. Create a mixture of smaller and bigger Christmas trees, use different color decorations and strive to make a joyful ambient. Of course, do not limit yourself only to Christmas trees; topiaries make a wonderful decoration for Christmas season, especially when decorated in Christmas colors. Another interesting idea is to wrap pine garland around posts, handrails and pillars. Combining them with other decorations, red bows and lights you will achieve a festive look. Just make sure not to forget the lights! The magic of Christmas can be felt everywhere. All around the globe people are getting in the holiday spirit and preparing for yet another season of joy, peace and love. By decorating our homes and our gardens we do not only beautify our living space, but we also contribute to the complete spirit of Christmas. Just by adding a few simple decoration pieces and ornaments we allow ourselves to relive our happiest childhood moments and forget about the worries of everyday life. May your Christmas holidays be filled with joy and comfort!